I have to admit that when I looked out of my window on Friday morning I nearly decided to close the curtains and go back to bed. It was lashing it down outside and the thought of driving to the Peak District and pitching a tent was decidedly unappealing. However I am glad that I made the effort as it was a cracking weekend. 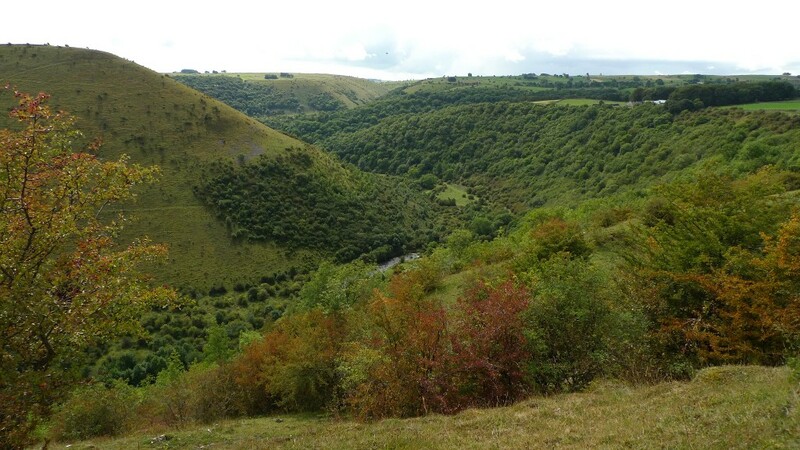 The weekend had been arranged by Terry who had booked a campsite for our sole use, just down the road from Monsal Head. The rain had stopped when I arrived and after pitching spent the rest of the afternoon socialising and having a few beers. 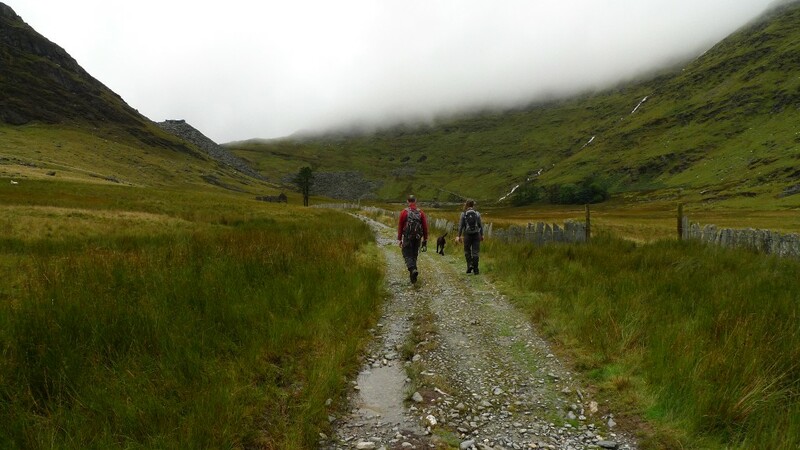 It was great to put faces to blogs that I follow and meet other like-minded outdoor folk. The cool, damp August air was escaped when everyone decamped to the pub for a convivial evening. Terry who had consumed one or two shandys provided some entertaining monologues which would make most excellent podcasts. Did anyone have a microphone handy? 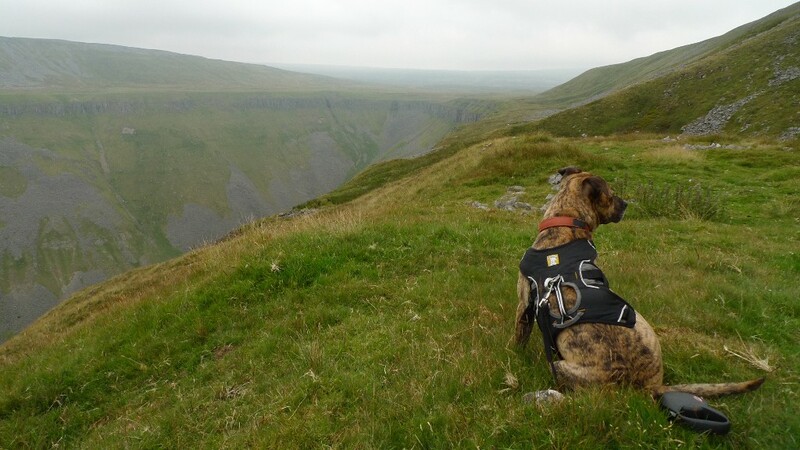 The relaxed informal nature of the weekend meant that I could escape and be unsociable for a few hours whilst exploring Monsal Dale with Reuben. 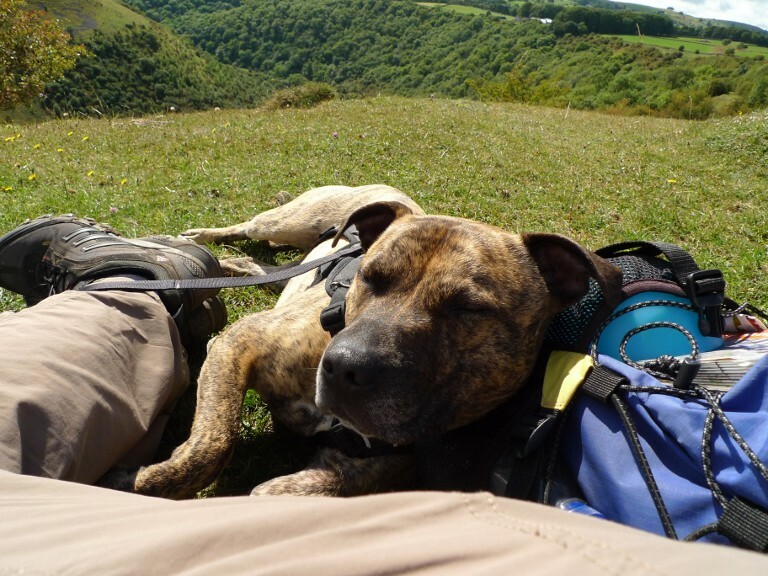 I managed to find a lovely shelf high above the valley and have a nap with the dog in the sunshine. A most pleasurable way to spend my time. Reuben the ‘Trig point dog’ managed to receive the affection of just about everybody who turned up over the course of the weekend. He proved to be a big hit and relished all the attention that came his way. 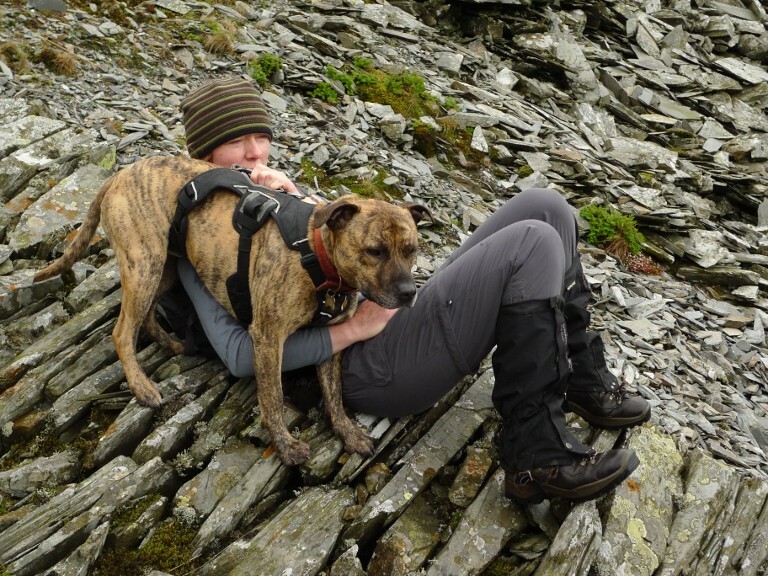 I am lucky to have such a good natured, well behaved and friendly hound! Returning from a few hours on the hill there was another convivial afternoon on the campsite, this time in warm sunshine. 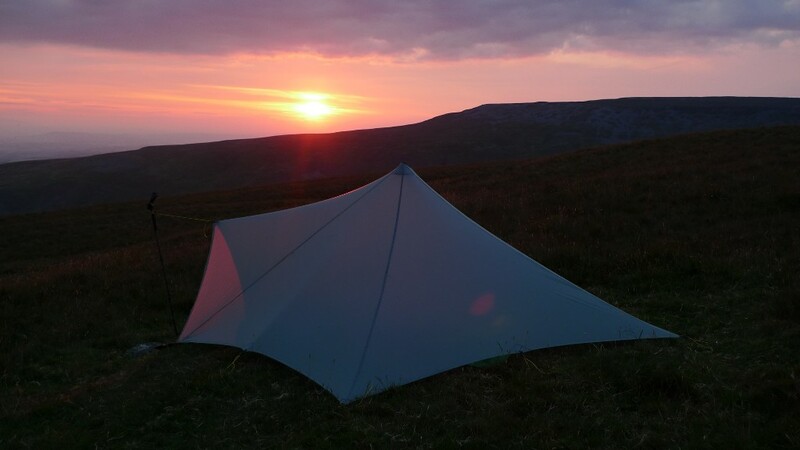 A guy from Rab popped along with a boot full of shiny technical fabrics for people to fondle and drool over, whilst Gareth from Webtogs pitched some new tents from Nemo. 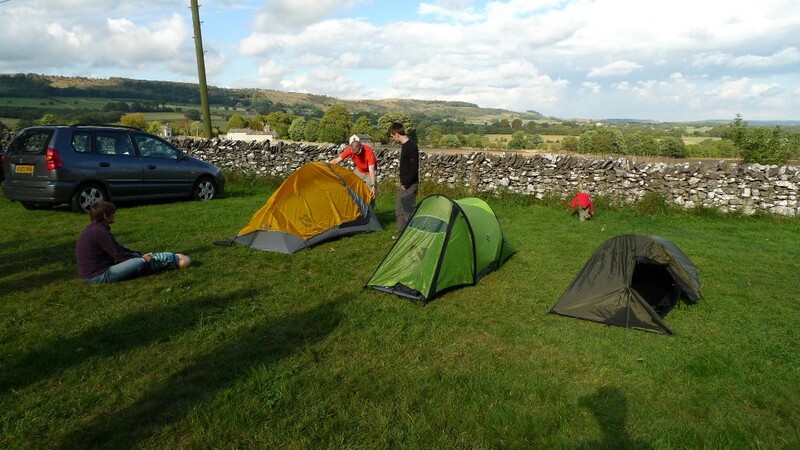 The pub soon beckoned for some more beers and happy campers returned late to the campsite for more socialising around the party tent. Sadly I did not take many photos, apart from when I went for my bimble. Here are a few that I did take. By Saturday afternoon the excitement had got too much for Terry. Gareth from Webtogs demonstrating how not to pitch a tent. 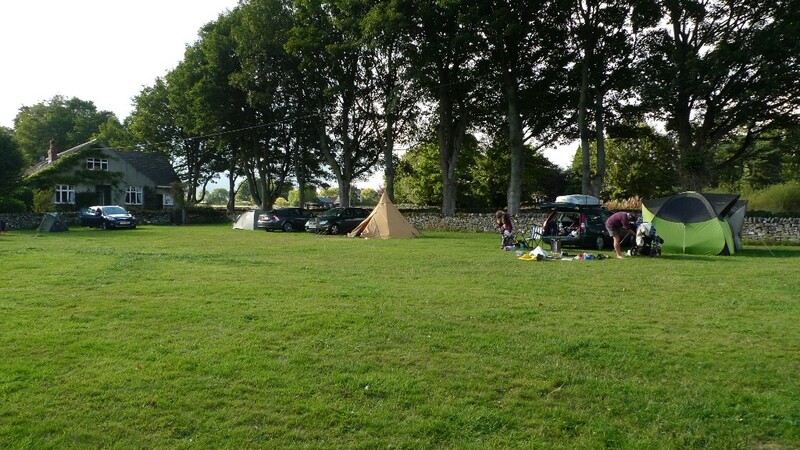 Acres of space at the weekends campsite near Monsal Head. The classic view of Monsal Head. 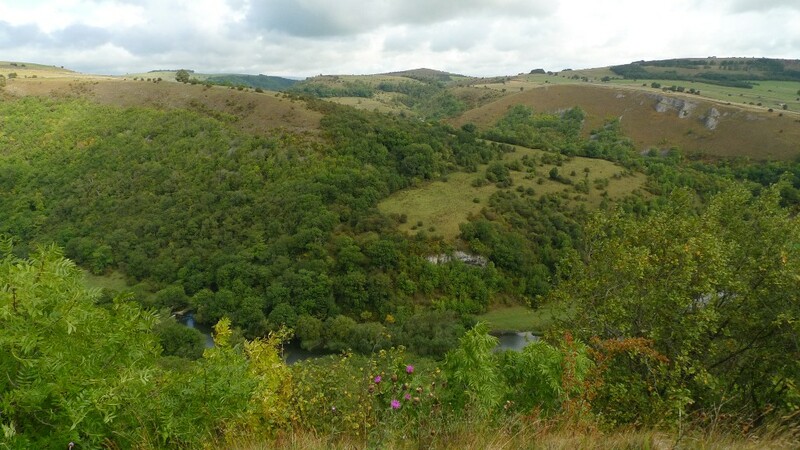 A view across the dale. Reuben spotting something of interest. 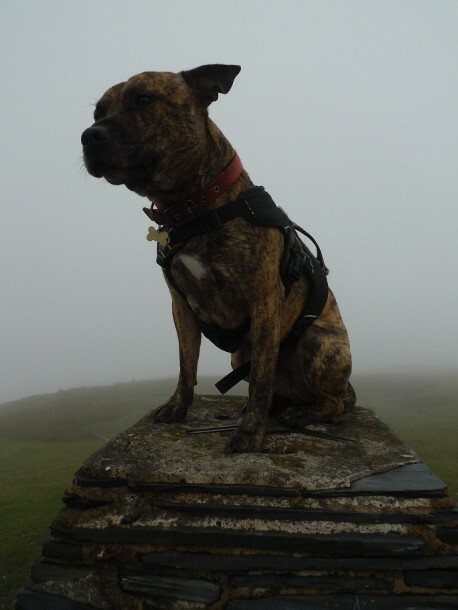 Reuben getting excited about the view on the summit of Fin Cop. 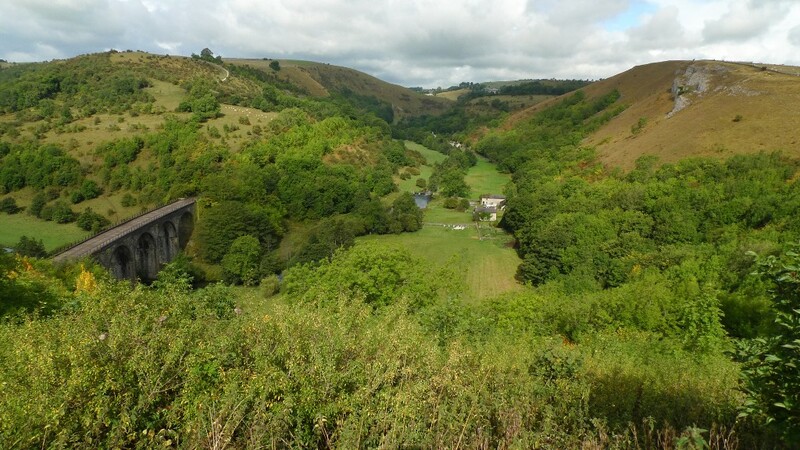 The hidden Hobs House in Monsal Dale. Early Autumn colours looking down the dale. Looking back across to Fin Cop, it was exceptionally steep descending from there. 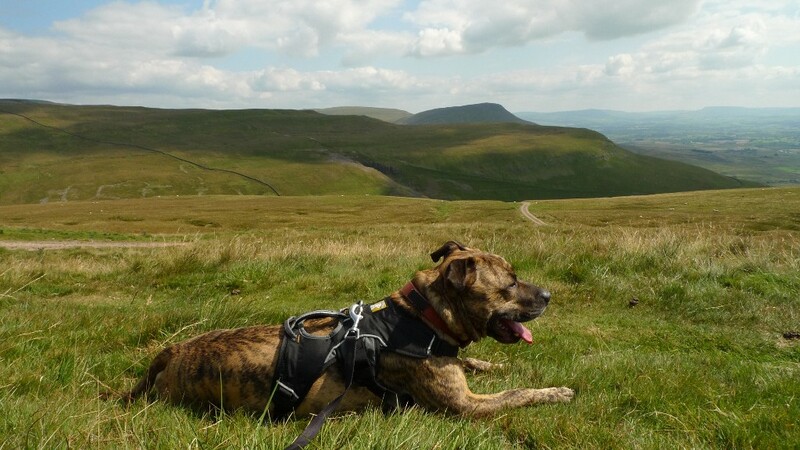 Taking time out on the hill for a snooze in the sun. 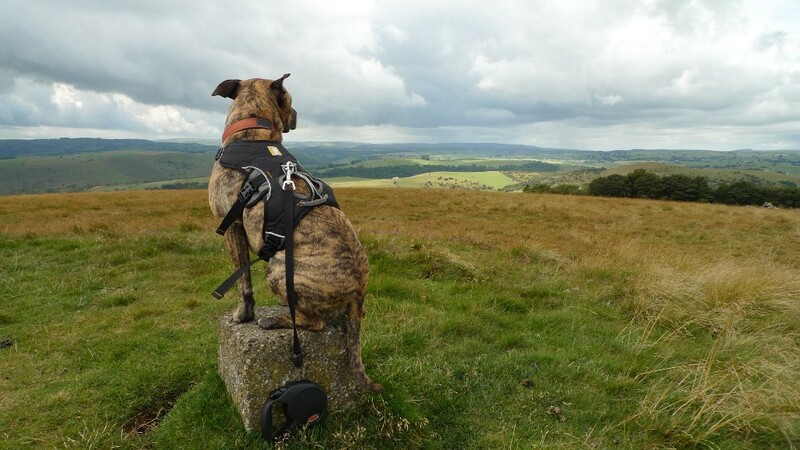 Reuben being a little disappointed by the lack of a trig on the summit of Longstone Moor. 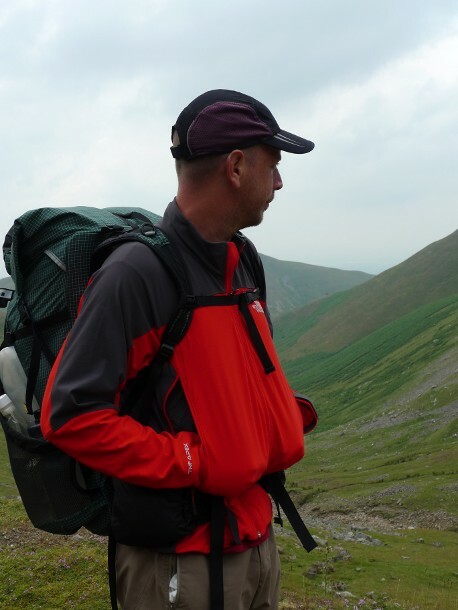 So cheers Terry for arranging everything, a quick video of Reuben showing his appreciation……………..
As a backpacker I have to admit that I have never really ‘got’ softshell jackets, I have never seen the attraction of them. For nearly two decades the tried and tested baselayer, microfleece and waterproof / or windproof system has served me well. For when backpacking, clothing needs careful thought into how one item compliments another. For example if it is cold I need to be able to wear everything that I am carrying, adaptability is key. I have therefore approached this review from a backpackers perspective. The North Face Men’s Apex Elixir Jacket was supplied for testing by Webtogs, for transparency I get to keep items provided by them unless stated otherwise. The jacket came in a rather fetching red / charcoal combo. The medium size fits me well, relaxed without being baggy, the Apex material being very stretchy. The North Face describe this material as their stretchiest and most breathable soft shell fabric and say that it is ideal for high-output aerobic activities in cold, dry climates. The fabric is finished with DWR to enable it to shed water. My medium size weighs in at 434 grammes on my kitchen scales. The jacket is relatively short, sitting just above my backside. The arms are a good length and don’t ride up when reaching upwards. I really like the way the cuffs can be adjusted, velcro with a slightly rubbery tab. Much more preferable to elasticated cuffs. The collar has a nice soft fleecy lining which although comfortable against the skin means that the collar does not stretch. I have to admit that I found it a bit too tight and restrictive when fully zipped up. I think that the best thing about this jacket is the pockets, they are large and sit above a pack hipbelt making them accessible. Each one is plenty big enough to fit a large laminated map in, a huge bonus for me on the hill. The inside is a soft mesh which is comfortable on the hands and which also serves as a good vent. The main zip is a standard ykk which for some reason zips up the wrong way round, as in female garments. This throws me each time I put it on! Finally the hem drawcord is tucked away nicely and is easy to use. As you can see from the photo below the material really does have a great deal of stretch to it, with my hands resting in the well designed pockets. So all in all a good jacket when standing around and fiddling with it at home, however conditions in my house are very different to that on the hills. How did it get on? I took the jacket out to the hills on four separate occasions, and as much as I wanted to like it and enjoy wearing it I have to admit that I did not. The weather conditions that I encountered varied considerably considering it was only worn in July and August. I experienced warm and sunny, cold and dry, and cool damp windy weather. For backpacking in summer I usually wear a smartwool long-sleeved base layer with a pertex wind shirt over the top if there is a breeze. A lightweight microfleece at hand if the weather gets cool. 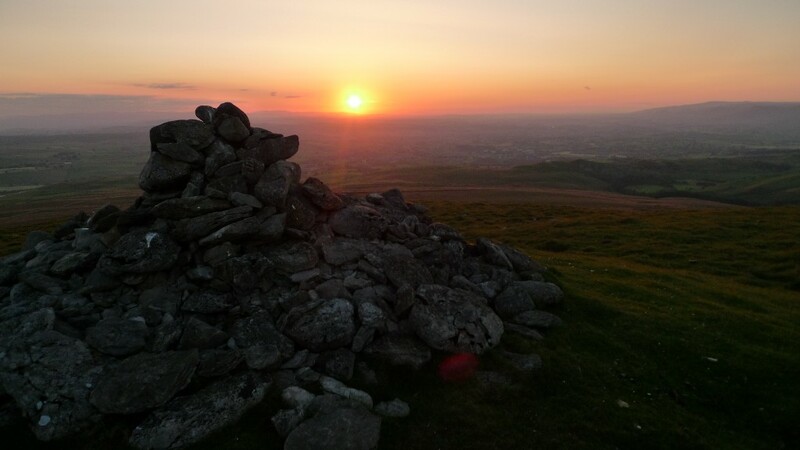 After a warm but breezy first day on the hills where the jacket kept me comfortable, the evening turned much cooler. I was soon shivering as the Elixir provided me with virtually no insulation. I had my microfleece at hand but underneath the jacket it felt bulky and uncomfortable due to the jackets fit. 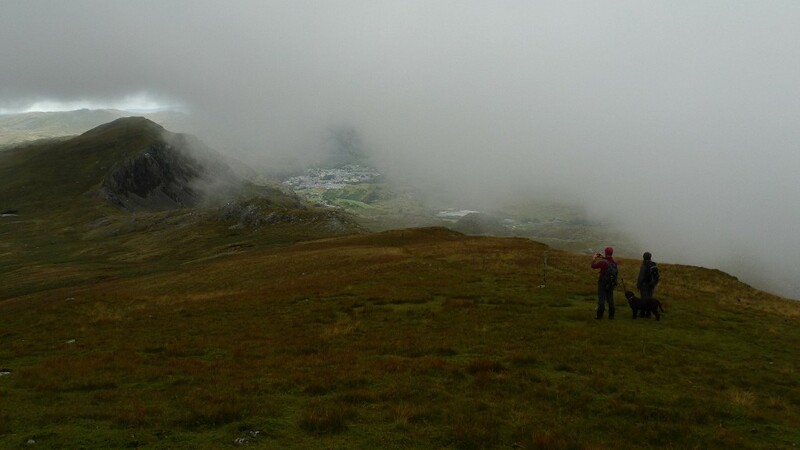 A day in the Moelwyns provided me with what could possible be called ‘typical’ British mountain weather. 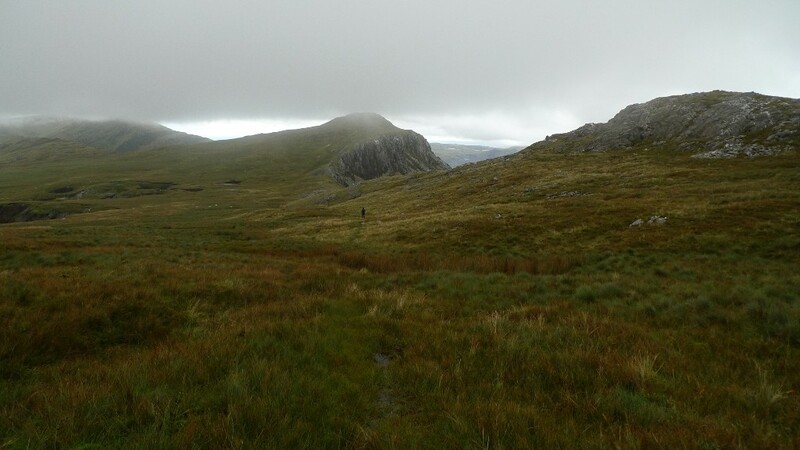 Warm and humid in the valleys and cool, damp and breezy on the summits. On the climb up into the hills I found I overheated too much, even with the pockets fully opened. I had to remove it and pull on my lightweight pertex windshirt, sort of defeating the object. On the cool windy summits I put the Elixir back on, it blocked the wind but I felt cold when stopping. On a positive note it did handle the damp claggy air well, moisture beading up on its surface. For backpacking I feel that at the end of the day it is an over engineered, heavy and expensive wind shirt. It is well made and looks good but I feel that it is much better suited to other activities. 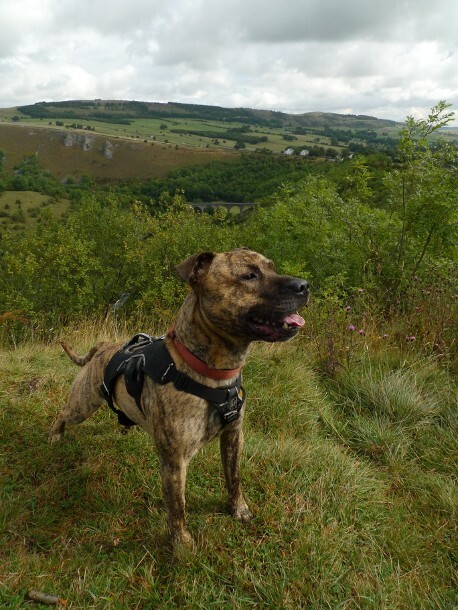 A rock climbing friend thought that it would be ideal for a day on the crags. Its excellent stretch and durable fabric being suited for climbing. As a windshirt for high activity in cold and dry weather it may well be a winner. 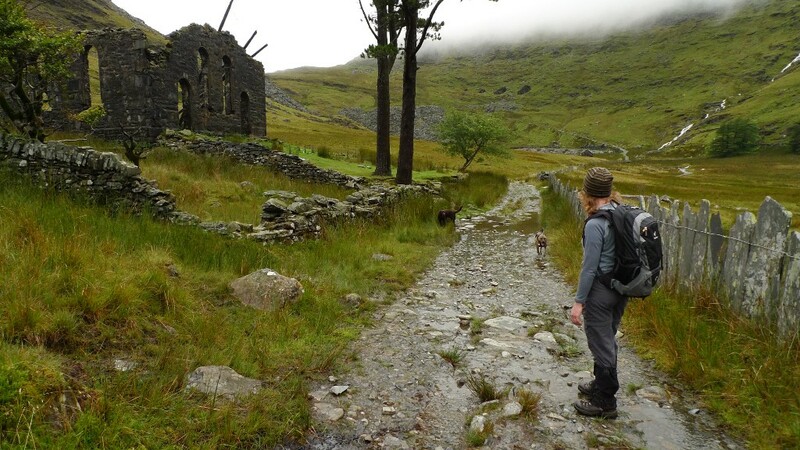 But for backpacking in the damp, changeable British hills it is less than ideal. The North Face Men’s Elixir Jacket can be purchased here. Webtogs also have loads of other soft shells on their website. 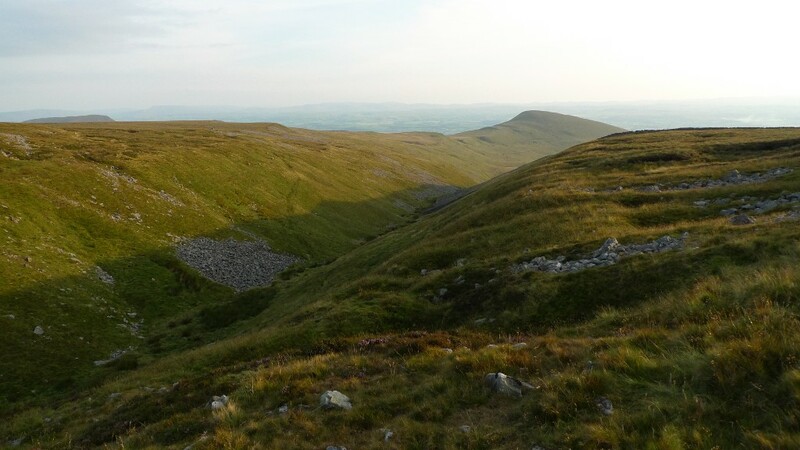 It was early evening as we passed through Kirkby Stephen and drove up to the summit of the moorland road. 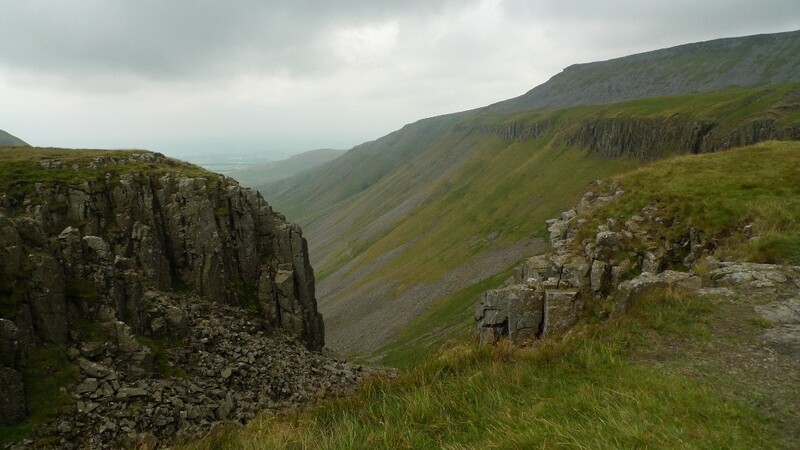 A good weather forecast meant that the planned two-day backpack taking in High Cup Nick was on. However before setting off on that we decided on a quick overnighter a short distance from the parked car. The reason for this? This was my backpacking partner Rae’s first backpack for several months after being diagnosed with plantar faciatis, a painful condition that has had her out of action for a while now. Secondly the weekend was to be Reubens first ever backpack and night outside. 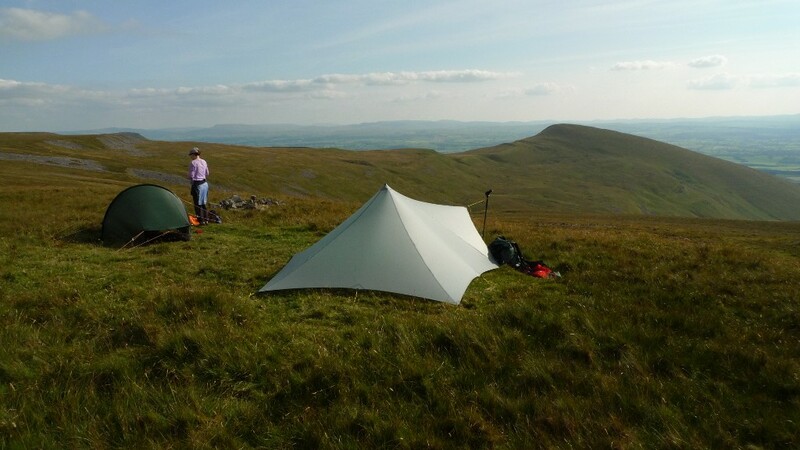 Thirdly I had a new shelter to play with, my MLD Trailstar. With a combination of factors coming into play it was good to know that the security of a vehicle was close by and packed in the boot a tried and tested tent. A gentle breeze blew across the grassland as we headed across Nateby Common, Reuben excitedly hoovering the ground with his nose. It was pleasantly warm, the sun still high in the July sky. Crossing the shoulder of Tailbridge Hill the ground was covered in a fragmented limestone pavement. 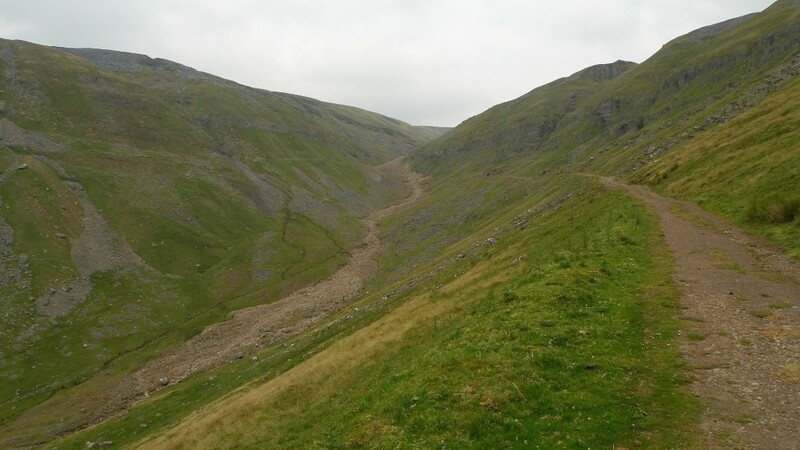 We made a short descent towards the hidden depths of Rigg Beck and found a patch of rough but reasonably flat grass. Although less than a kilometre away from the road, the rest of the world felt a million miles away. 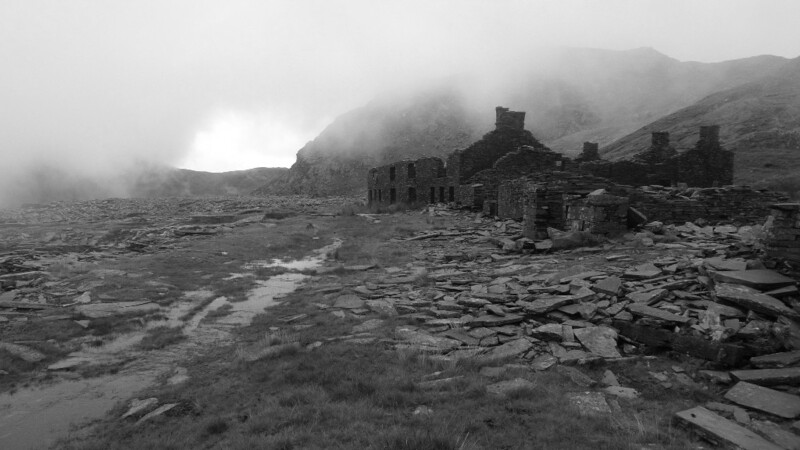 It would be unlikely that anyone would stumble across our camp in the next twelve hours. 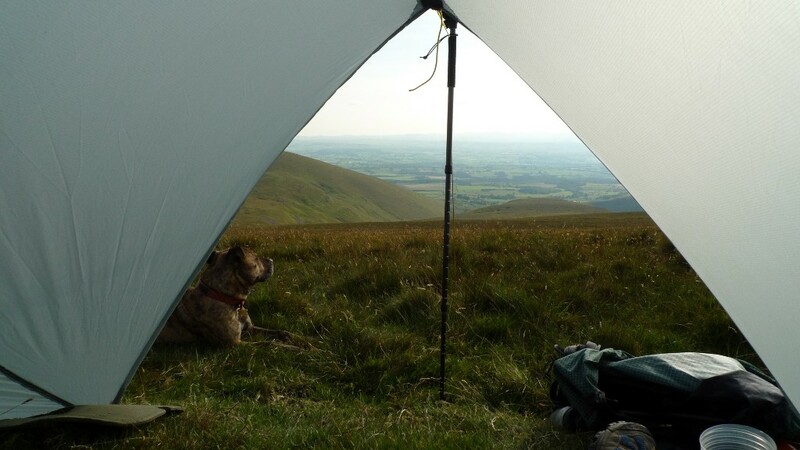 It can take a while to get your head around setting up a new shelter but the MLD Trailstar is intuitive. Within minutes I had managed to get a good taught pitch, not perfect but I was pleased non the less. The main problem with it is finding a patch of ground that is big enough, the footprint is simply huge. Water was fetched out of a nearby stream and with camp chores done I sat around taking in our rather lovely surroundings. 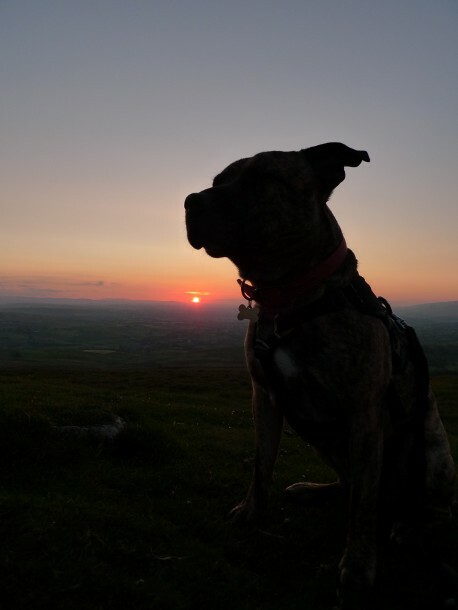 The sun started to set directly behind the summit of Tailbridge hill and as soon as it disappeared out of sight from camp I headed up hill with Reuben. I had a feeling that something special was about to happen when the hills behind me started to take on a pink hue. Reaching the summit the panorama was simply breathtaking. 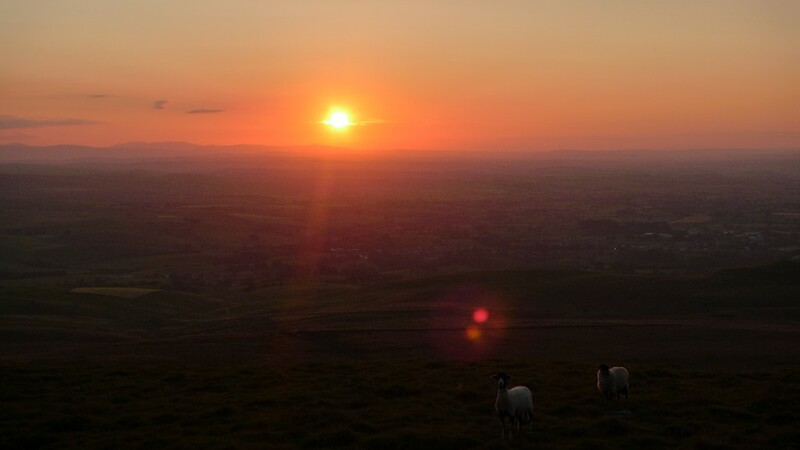 The Eden valley was laid out in front of me with the distant Lake District as a backdrop. The sun was making its final descent towards the horizon and putting on a fiery display as it did so. 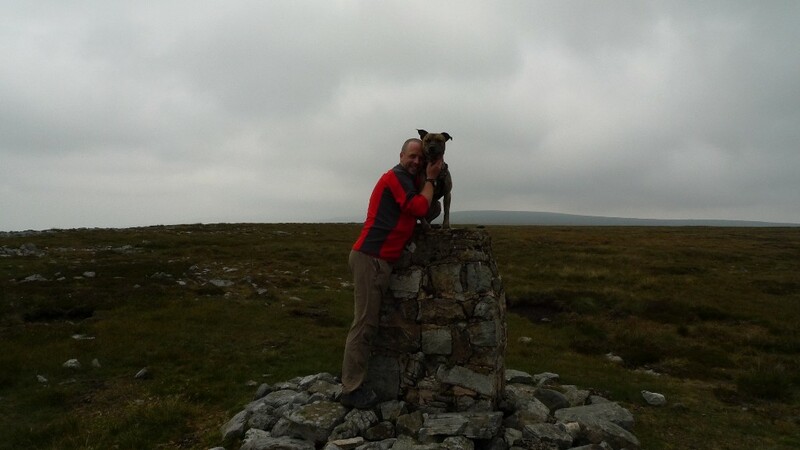 I sat by the summit Cairn with Reuben for a good half an hour and watched the spectacle whilst snapping away with the camera. A chill breeze and a rumbling tummy soon got the better of me and we headed on down back to Rae and our camp. It was good to sit in the gathering twilight to cook and chat, an outcrop of limestone making a good bench. 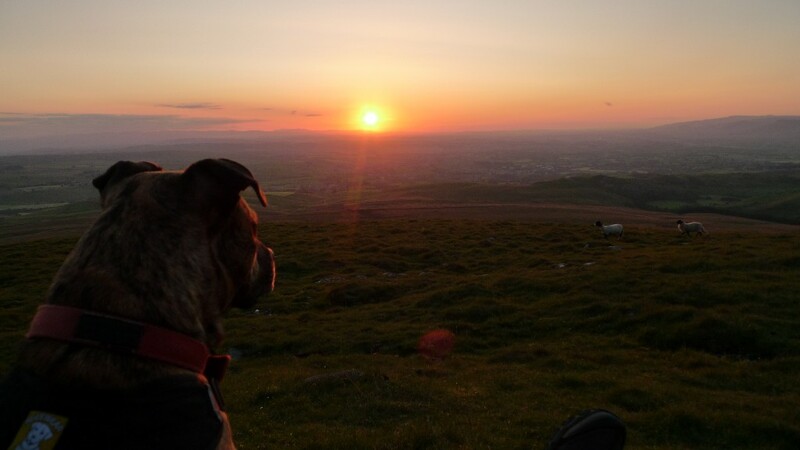 Retiring to my shelter with Reuben was a completely different experience for me. 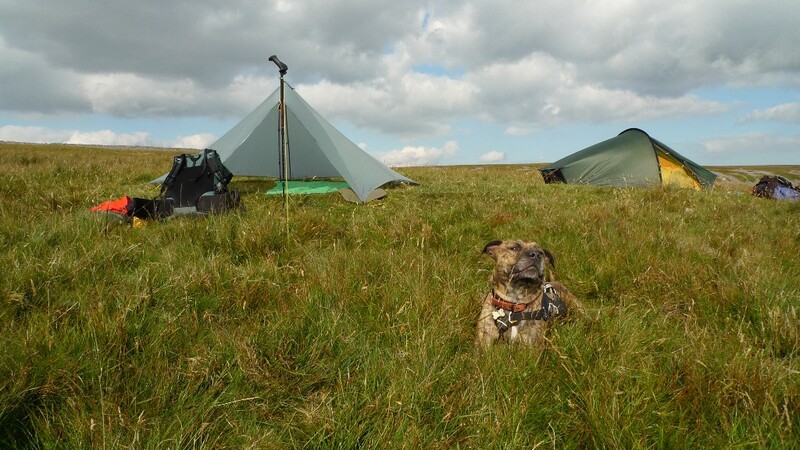 Firstly it was the first time that I have not slept in a fully enclosed tent, and secondly it was my first time sharing a shelter with a 22kg bundle of fur! I put on Reubens fetching jacket and laid out a fleece sleeping bag liner on an old roll mat, he hopped on and I zipped him in, only his head sticking out. For security his lead was pegged into the ground, I did not want him wandering off during the night. I settled into my sleeping bag, enjoying the experience of being able to lay there and watch the lights twinkle down in the valley, I quickly drifted off. I was soon rudely awakened by a low growling and what can only be described as a wuff, Reuben very rarely goes woof. I turned on my torch to find him sitting at the entrance, staring out into the darkness. It was a bit unsettling as I could not see anything out there, I called to him but he ignored me, intent on guarding our shelter. I was awoken with a wet, smelly lick and opened my eyes to find Reuben standing directly above me. He had obviously been woken by the small army of midges that had invaded our shelter. I was soon up and dressed before looking at my watch, it was not even 7am. I made coffee and breakfast, aware that it was probably too early to wake Rae who was safely tucked up in her Akto. The midges were few in number but pretty annoying, not enough however to spoil a peaceful morning on the moors. Rae was duly woken, rucksacks packed and we were soon back at the car ready to drive to Dufton for the start of our short backpack. To save Rae a painful slog along tarmac with her plantar faciatis I dropped her off just outside Murton so that she could sit for a while in the sun. I drove on to park by the lovely village green in Dufton, where I shouldered my pack and headed back the way I had driven. 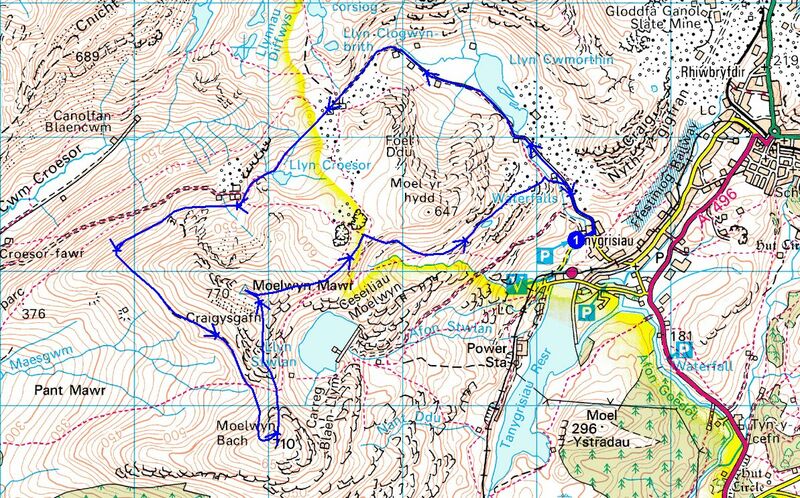 It was a long hot slog in the sun and it seemed much further than the map suggests. 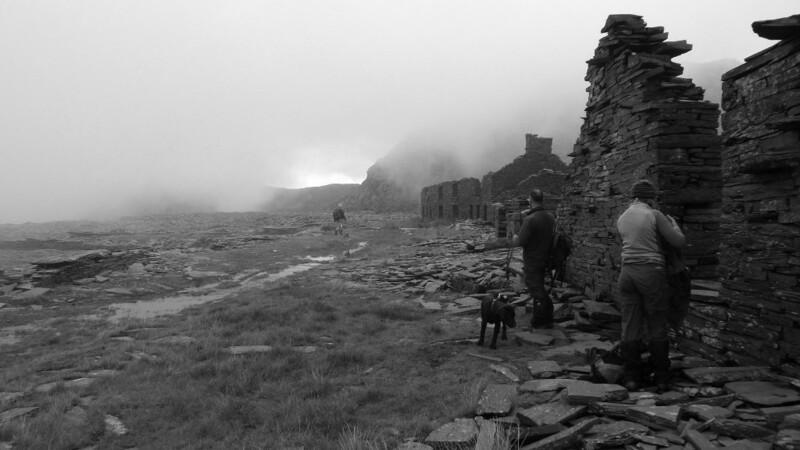 It suddenly dawned on me that I could have left my pack with Rae, lightweight would have been the way to go in the heat. My pack was heavier than normal as I was carrying extra doggie related paraphernalia, Reuben oblivious to this as he happily trotted along side. Picking up Rae we headed through Murton, another idyllic village and found a handy bench just before the track climbing up Murton Pike. Lunch was consumed in the sun, the peak above us looking steep and high, I was not looking forward to the climb. 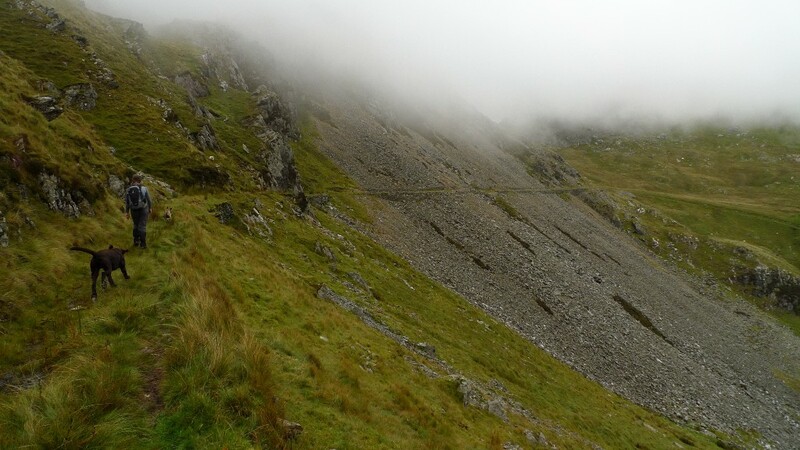 The only way was up, however the track climbed at an easy gradient and we soon gained height. My water rations were running out, I was careful to keep Reuben hydrated but this had been at my expense. 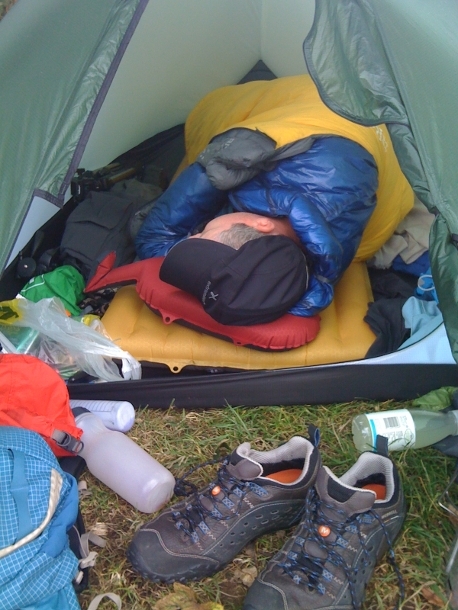 I was feeling increasingly tired and slightly sick, I am not designed for backpacking in hot weather. 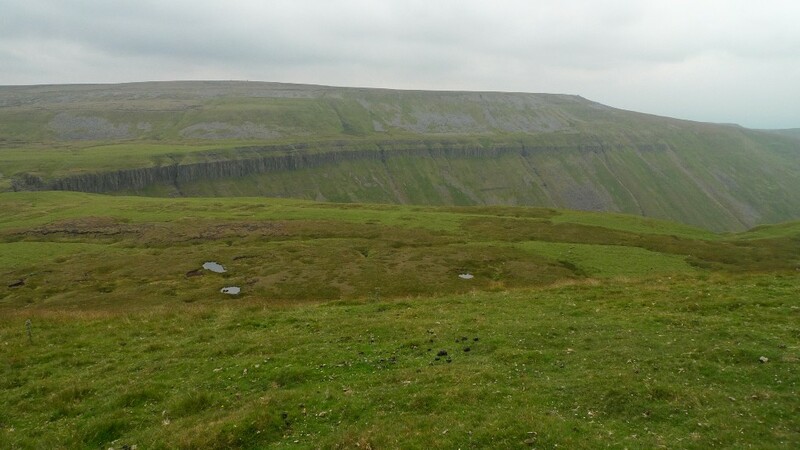 At the col below Murton Pike we lounged on the grass taking in the extensive views. 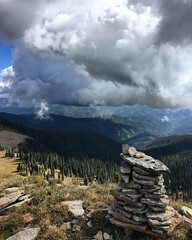 I had planned to climb the conical peak but could not summon the effort to do so. 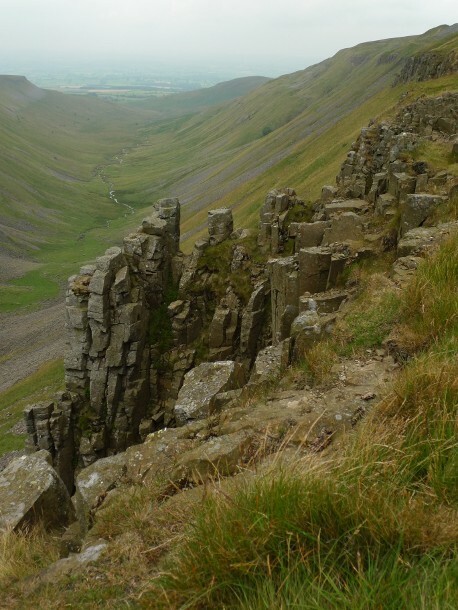 I needed water so we set off higher up the track before branching off across country towards Trundale Gill. The walking itself was very agreeable but all I could think about was glasses of cold water! 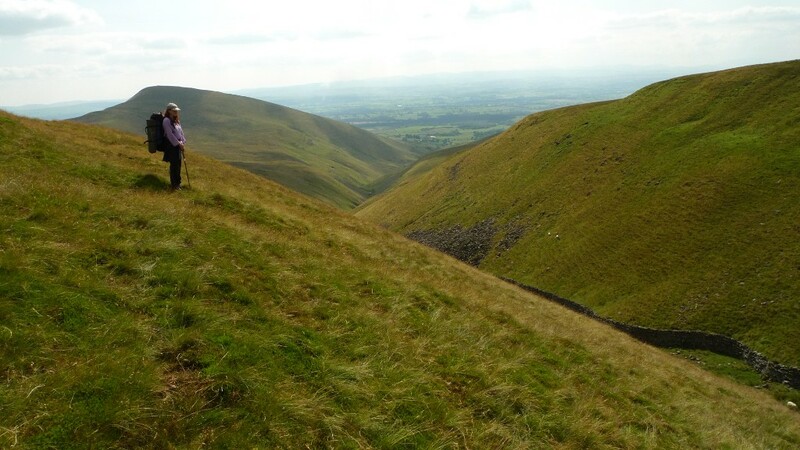 We were soon above the deep trench of the upland valley, impressive as it snaked its way down towards the Eden Valley. 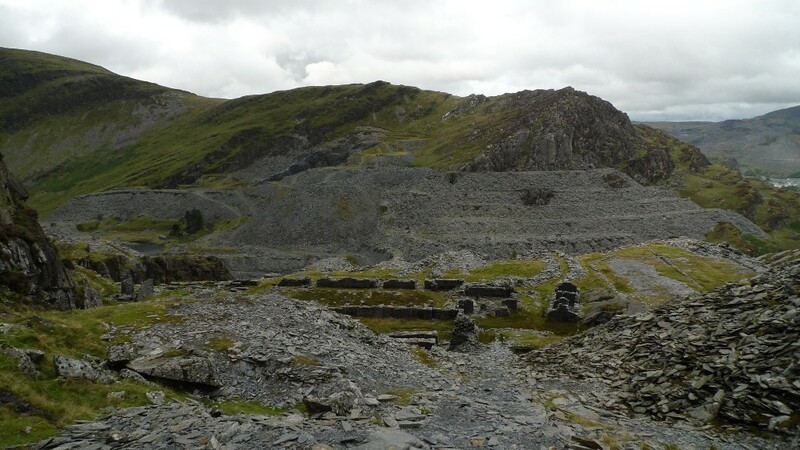 Alas from our vantage point we could see that it was bone dry, the bottom covered in sheep nibbled grass. It was obvious that water rarely flows down it from this high up, even though the map shows its source at least a kilometre above us. Feeling increasing dejected I led the way down so that we could cross onto the opposite hillside. There was a feint sound of running water and I spotted a green flush down a steep bank. 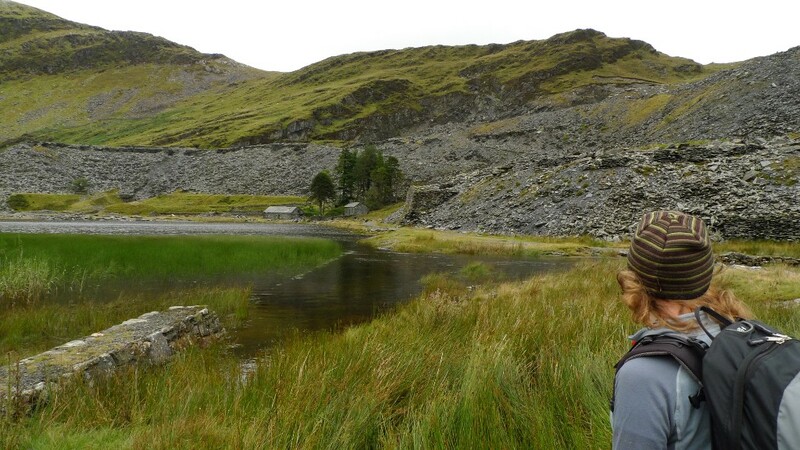 A bit of digging around and we managed to access a wonderful spring at the point it exited the hillside. It was so cold that our bottles ran with condensation as the freezing water came into contact with the warm air. It was sheer bliss to be able to drink deeply and I felt that I could relax once again, who would have thought water would be so hard to come by on these usually wet and boggy hills? With a water source located we thought it prudent to find a pitch within a short distance, just in case all the other streams had dried up. 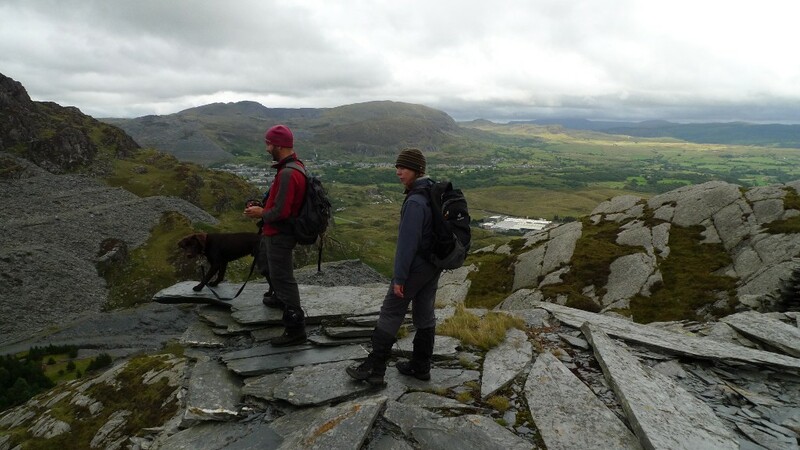 A steep climb towards a cairn on the horizon and we found the perfect spot. All around was rough grassland with the exception of a square of flat sheep nibbled grass, just the right size for two tents. It was perfect and we soon had our tents up, doors facing the spectacular view. 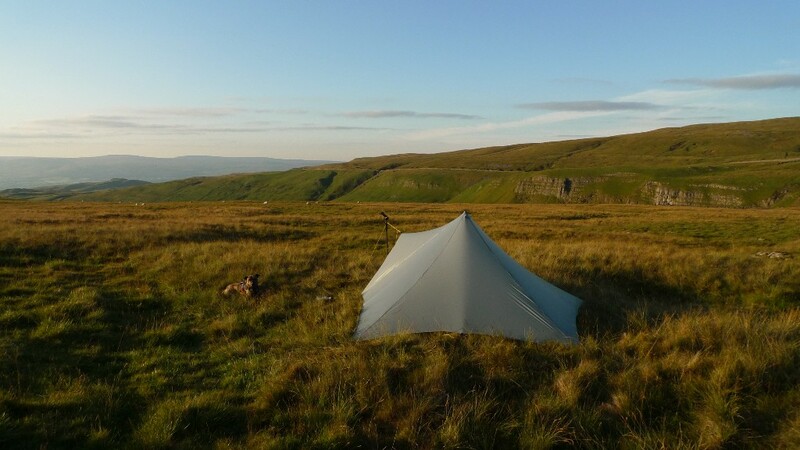 We were just above the 2000ft contour and there was a stiff breeze blowing, perfect for keeping the midges at bay, if anything we were worried about camping in such an exposed spot. At that point in time it was simply one of the most perfect pitches I have found. After fetching more beautifully clear, ice-cold water I sorted my shelter out and sat in the sun for a while admiring the views. 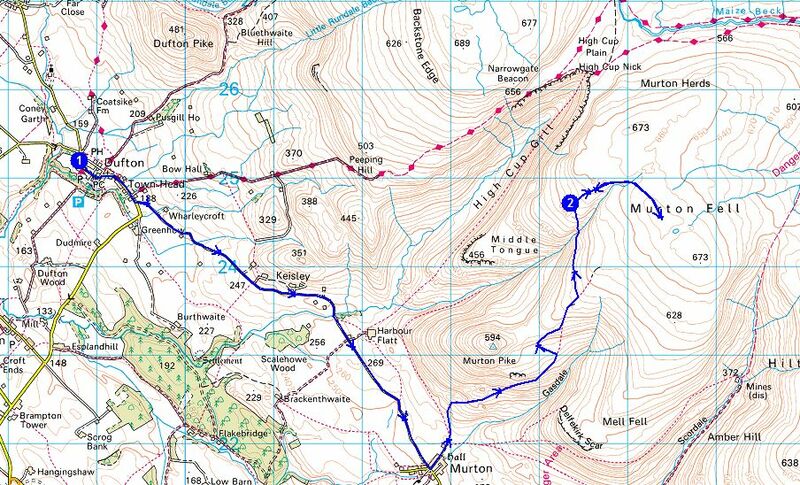 Murton Fell was behind us and is the only hill in the surrounding area I have not yet climbed. 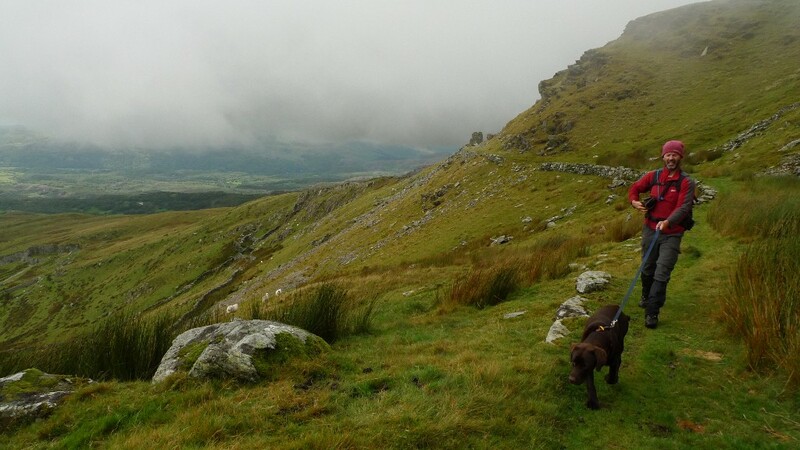 Leaving Rae to enjoy camp, Reuben and I headed off towards the summit, admiring the views back towards Murton pike. 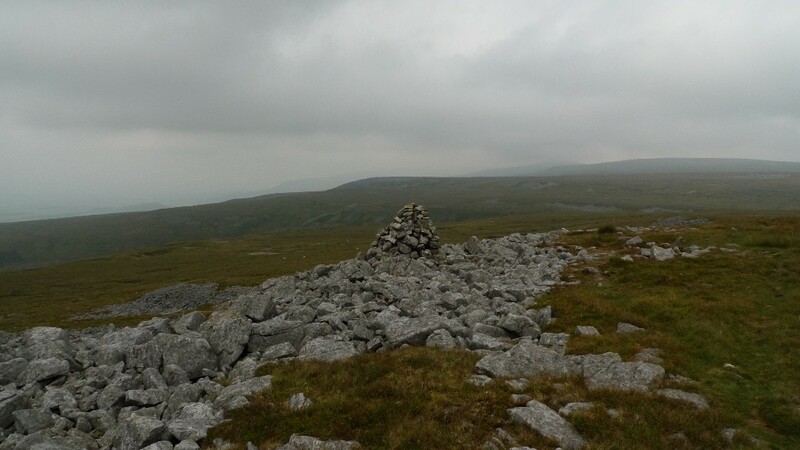 The summit itself is flat, featureless and pretty boggy. 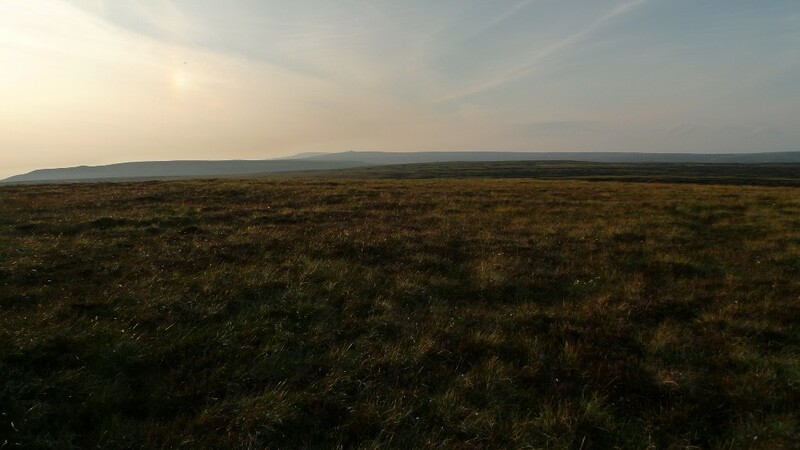 There is however a great feeling of space and sky up there, endless moorland stretching off to the horizon. Stopping at the cairn I realised that the air was now completely still, within seconds I was covered in midges. The magical spell was now broken so we headed back the way that we had come to escape the troublesome beasts. Walking through the peat groughs the amount of midges were an impressive, although worrying sight. In areas sheltered from even the lightest breeze, huge black clouds of them rose like smoke, dancing in the now humid air. The hillside was alive with their buzzing, not the zzzzz you get when one buzzes in your ear but a constant high-pitched hum. I quickened my pace to the wall that is the boundary between the elevated bog and the grassland on which we had pitched. Thankfully they disappeared as a gentle breeze was blowing over the escarpment. 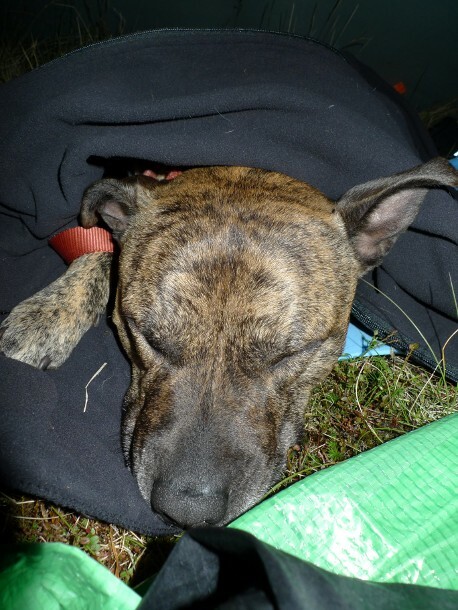 I walked over to Rae who was lounging in her tent to tell her of the midge hell on the hill. With perfect timing as I got to her the breeze there suddenly died as well. Like a scene from a horror movie clouds of the little devils rose, driving her inside and me into a flapping demon. The next hour or so was simply hell, midge net on I paced up and down the hillside, to stand still for more than a few seconds was too much to bear. Reuben was frantic and ran up and down with his face in the grass, like a demented canine snow plough. Another splendid sunset failed to impress me at the time, it was mostly hidden behind a thin veil of a midge net. Thankfully just as darkness was approaching the temperature suddenly dropped and a slight breeze picked up. The midges fell as quickly as they had risen. 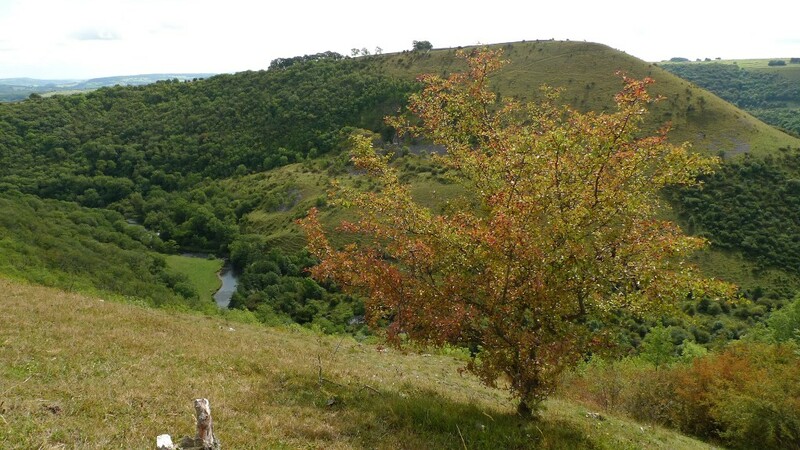 Once again our camping spot was the idyll that it had originally been. After a day of excitement Reuben had a wuff free night and I managed a good sleep. 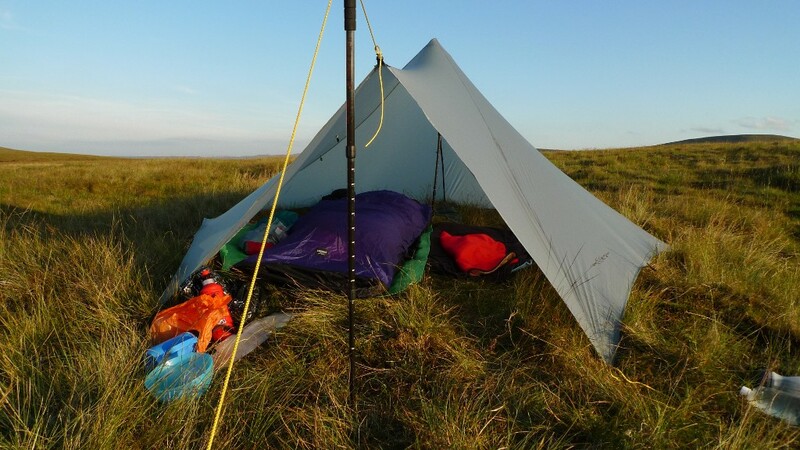 I did however wake up with most of my legs out of the shelter at one point in the night, the pitch was not as flat as I originally thought! 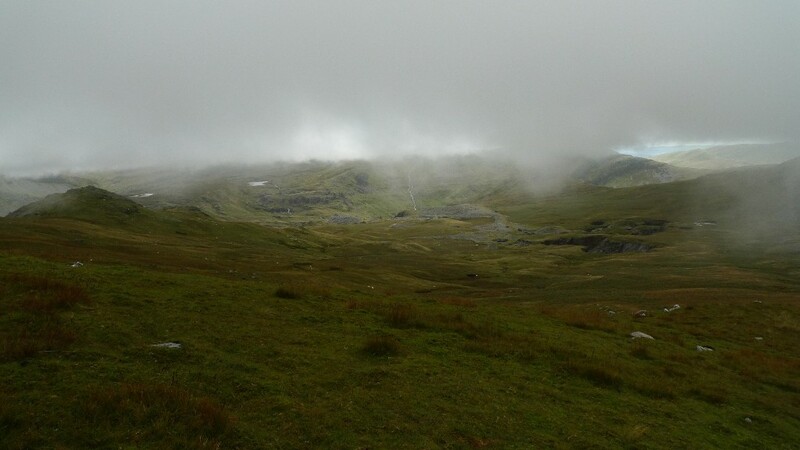 Worries about the possibility of abandoning camp in the early morning were unfounded as dawn brought a strong breeze with murky cloud and drizzle. The views from our high perch had vanished and it looked like there was a risk of us being enveloped in hill fog which was already drifting over the higher hills. 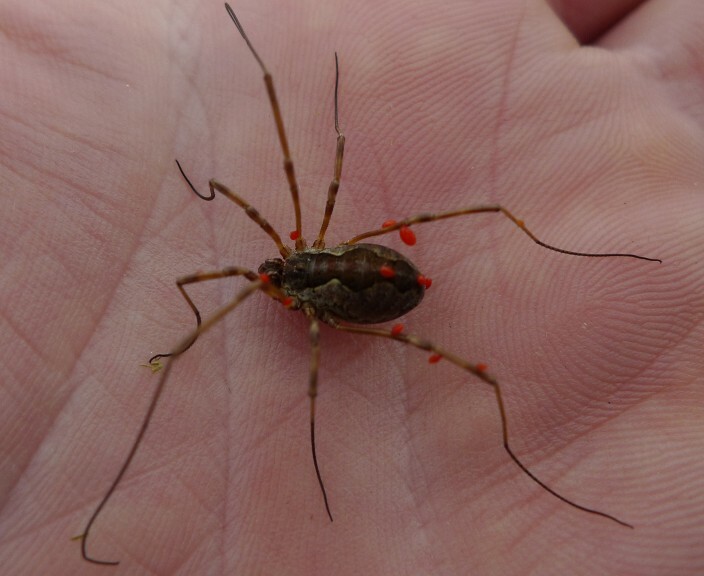 Packing up my gear I found a lovely spider which sadly had perished underneath my sleeping bag, its legs covered by some sort of mite? The contrast in the weather from the day before meant that we did not hang around for long once packed up. 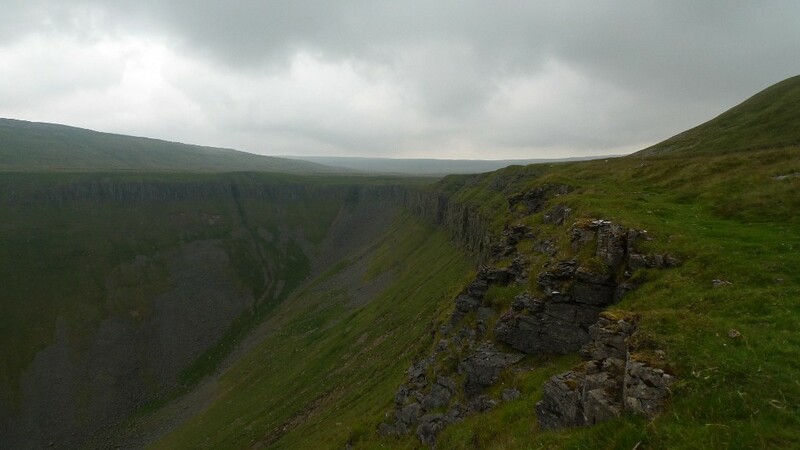 Staying on the same contour line we crossed a wall by a ladder stile and got our first view of High Cup Nick. 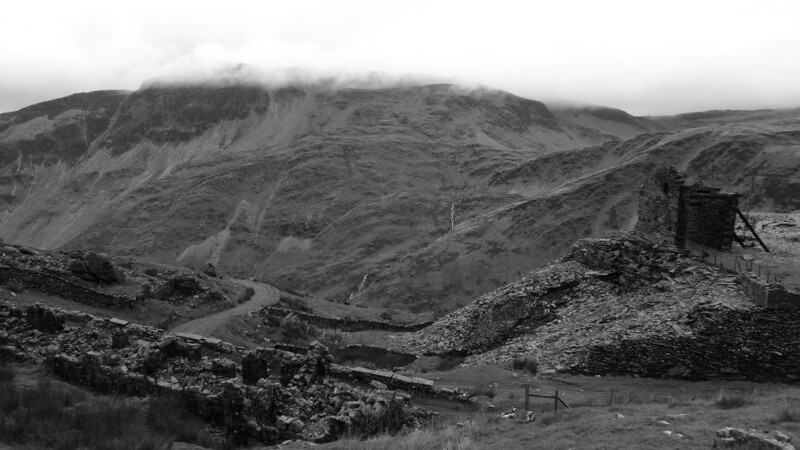 It has got to be one of the best geological features in the country and I always end up awestruck whenever I see it. If you have never visited before I highly recommend approaching it from the bleak featureless moors to the east. That way the ground suddenly plunges away at you feet. However from our line of approach we got the pleasure of walking along the entire southern rim. 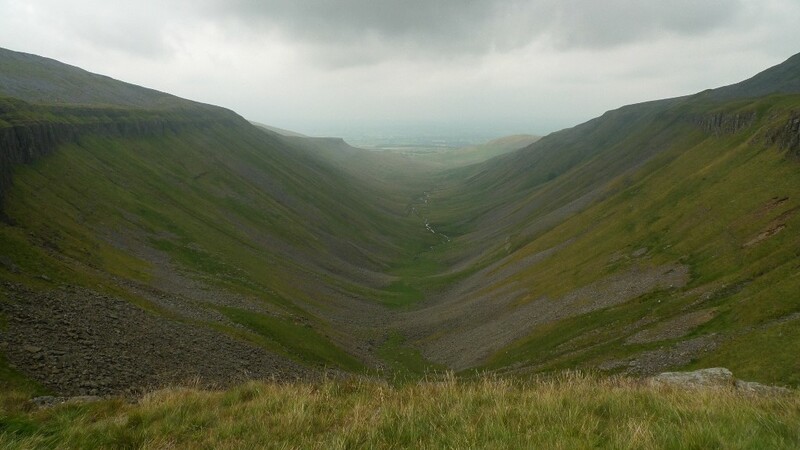 From the head of the valley, the scale is so large that it is impossible to fit it all in to a photo! 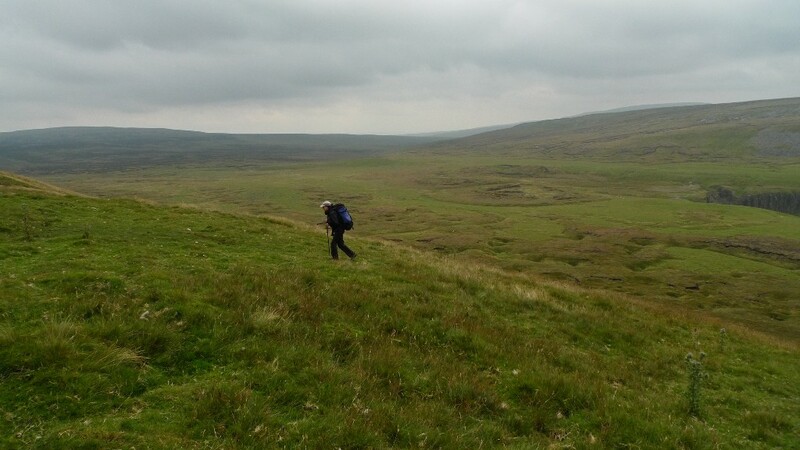 We stopped for a while and chatted to two Pennine Way walkers who were heading from north to south. 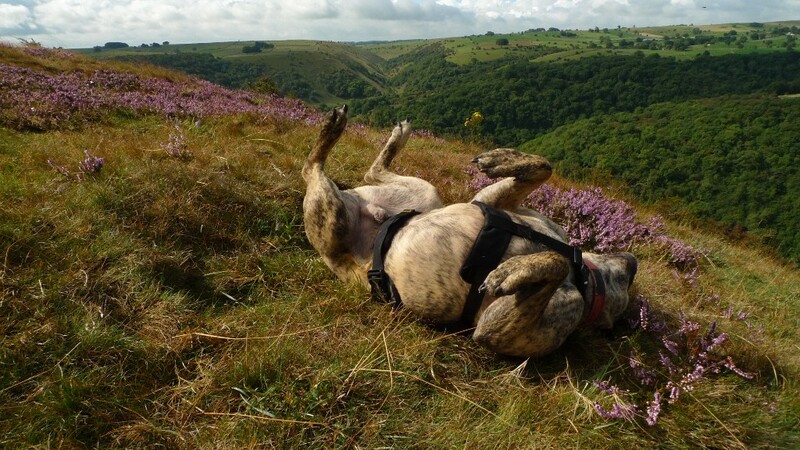 One of them enjoys it so much that he was on about his 5th end to end walk. 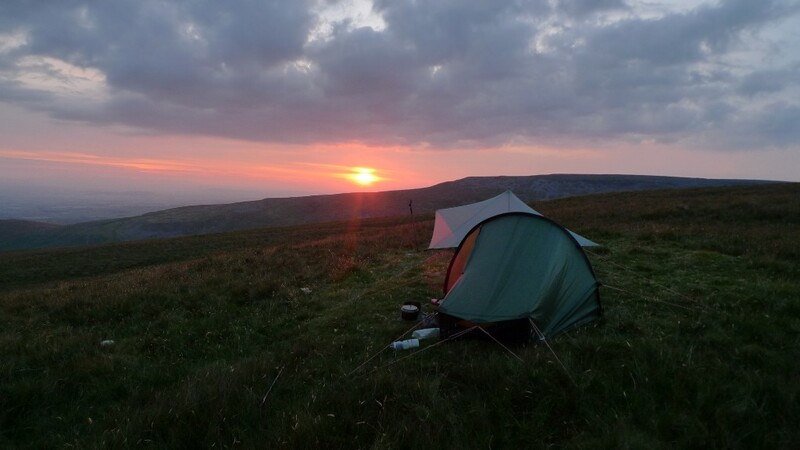 To camp here and watch the sun set would be spectacular, especially if the sun was aligned down the valley. 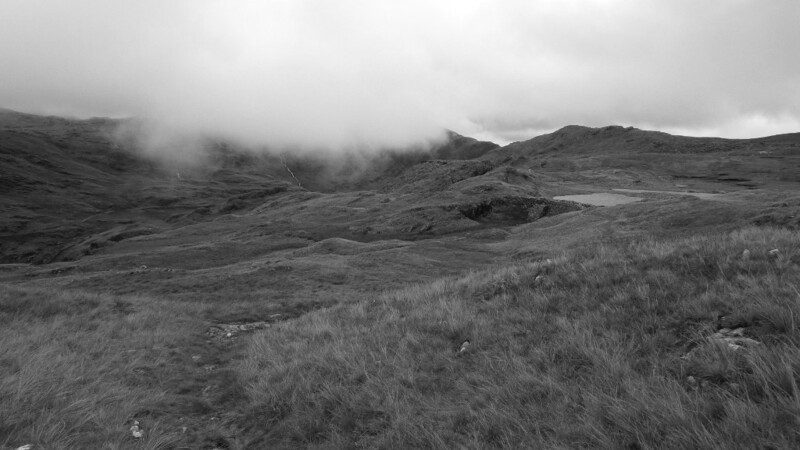 Sadly the murk was not allowing us views across to the Lake District and it was rather chilly standing around. Climbing grassy slopes towards Narrowgate Beacon we got a good impression of just how extensive the moors are in this area, they continue unbroken by roads for miles. This area is probably as wild as it gets south of the Border, no jagged peaks, just huge open spaces. 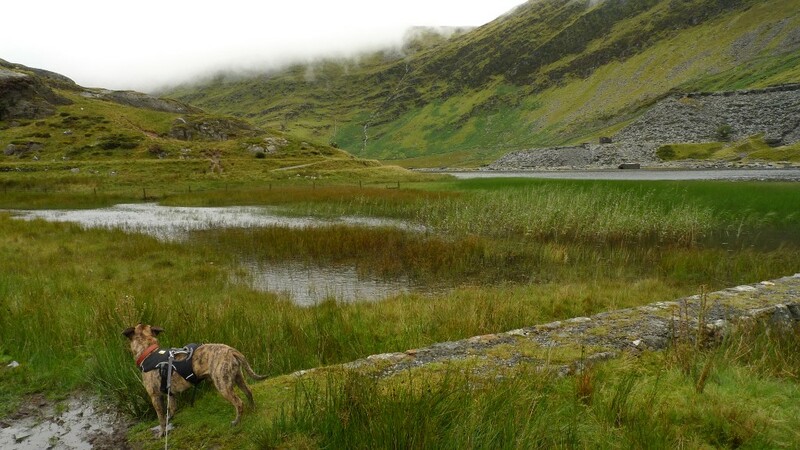 I was aware that although open access land, the area to the north excluded dogs. Not for conservation mind, but strictly for the preservation of grouse which were coming close to the annual pop of the gun. 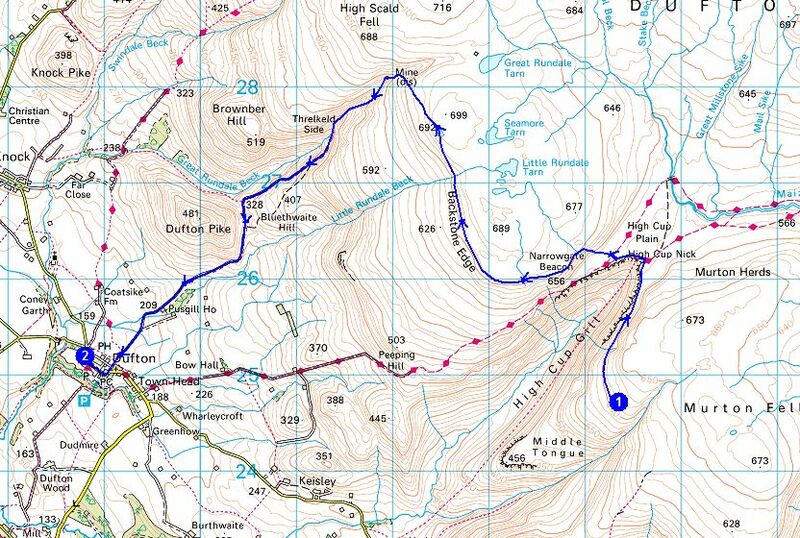 Our onward route just about skirted this exclusion zone as we headed north to the trig point on Blackstone edge. 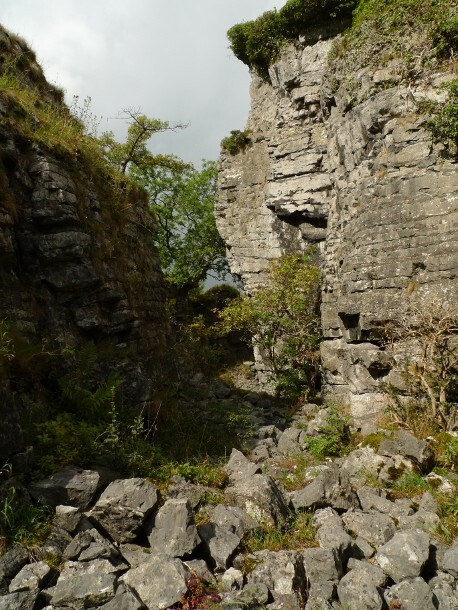 A narrow path along the ill-defined edge has developed and gave easy walking along the escarpment. 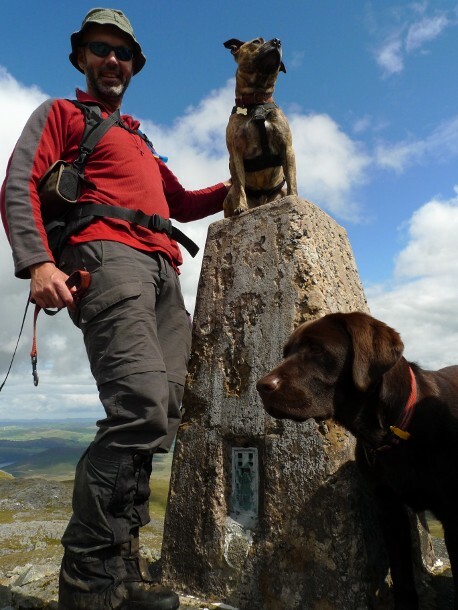 Reuben has now sussed out that whenever there is a trig point he will be requested to pose on top of it! We had planned to stop for lunch at the shooting box near Great Rundale Tarn but realised this was in the doggie exclusion zone. 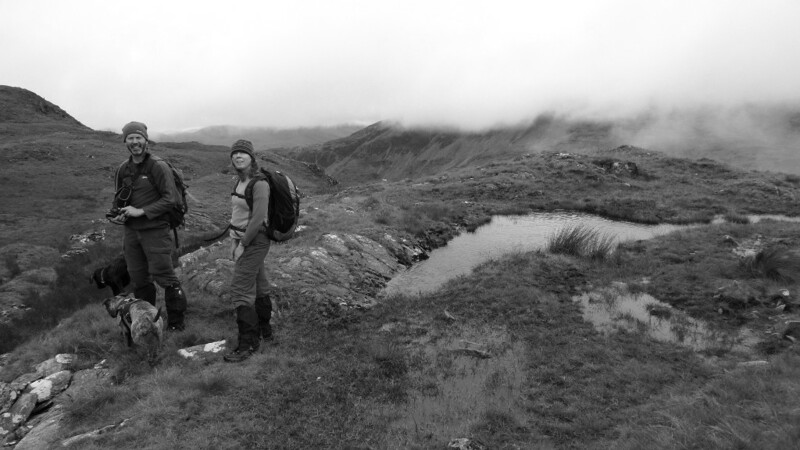 Not wanting to risk a telling off we continued along the edge past numerous cairns looking for a sheltered spot. 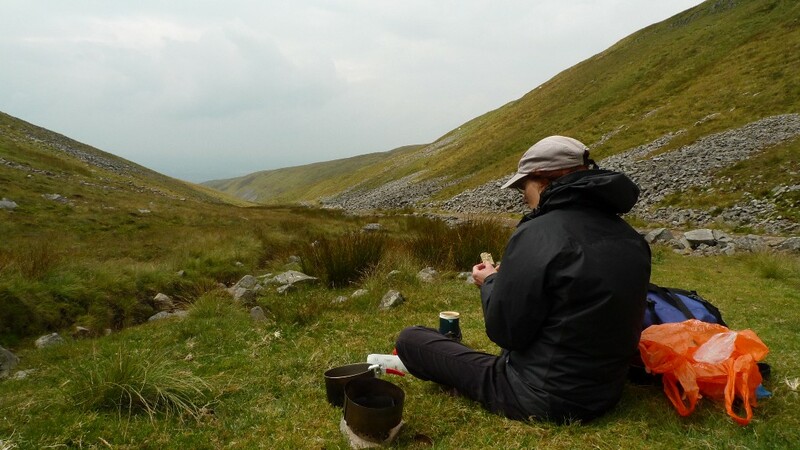 The deep valley of Great Rundale Beck provided a bit of respite from the nagging wind, enough to get a stove out and a brew on. Soft mossy grass provided an ideal spot to lounge around for a while, a last bit of the wilds before heading to civilisation. 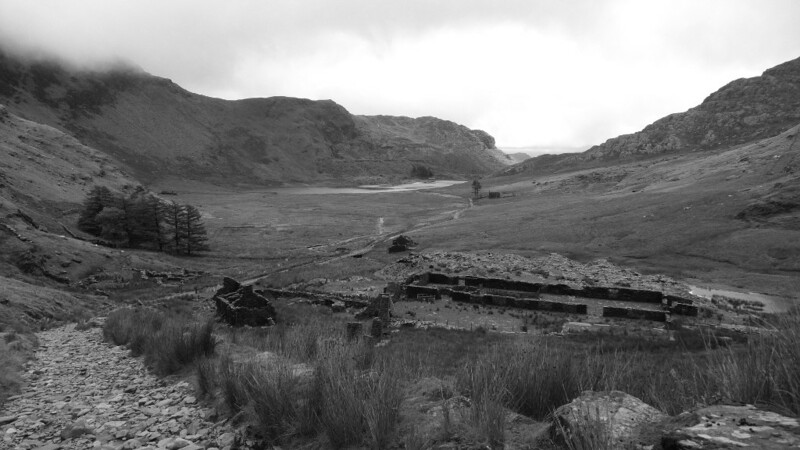 Great Rundale Beck has been ravished by mining, the hillside scarred and littered with the remains of the mines. It is a fascinating place to walk down, although I would imagine it must have been much more beautiful before it was touched by the hand of man. The vehicle track brought us swiftly back towards civilisation, the cone of Dufton Pike blocking the entrance to the valley. 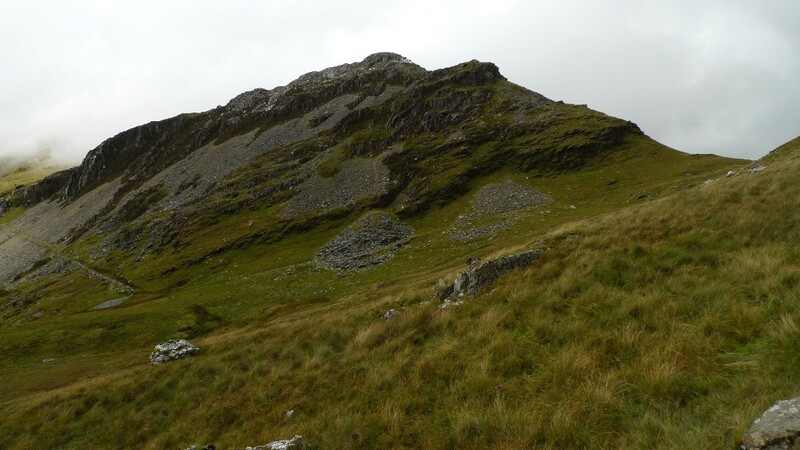 It is a cracking little hill, well worth the steep climb to its pointy summit. Not this time however with bellies rumbling and a thirst needing to be quenched we were soon back in the rural idyll of Dufton. This is the sort of village that I dream of living in, about as English as it gets with stone cottages surrounding a lovely green. A pretty and welcoming place but with huge desolate moors peeking over the trees. I sat and daydreamed as we devoured sandwiches outside the cafe. The damp chill in the air made a mockery of the fact that it was mid August. 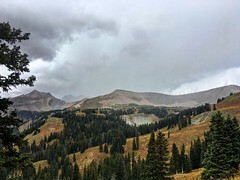 The swirling low clouds clung to the mountain slopes, briefly revealing their presence. 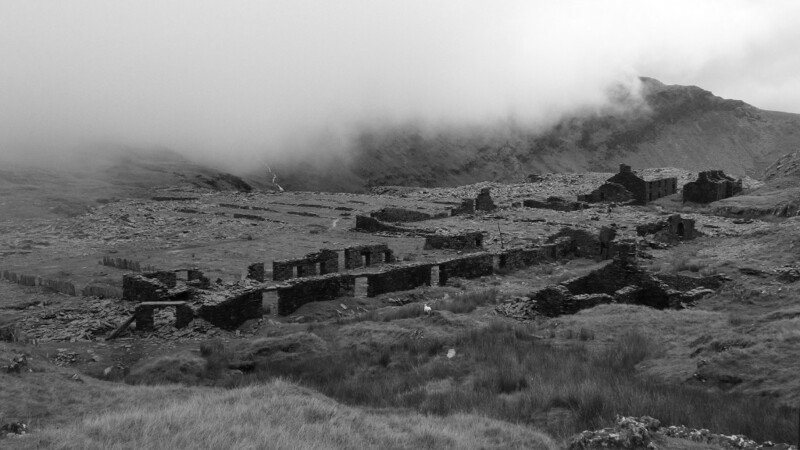 We sheltered behind the ruins of the mine building, its ruined state adding a certain amount of gloom and foreboding to the surroundings. Bellies filled we set off into the uncertainty of a complex mountain world, in search of the next feature that was clearly identifiable on the map. 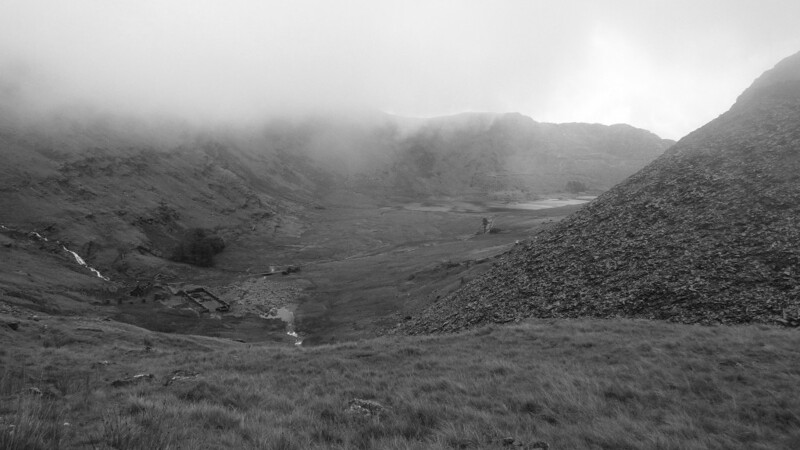 The rest of the day was spent in a hidden mountain world, ragged holes in the cloud giving occasional glimpses of rock and moor. 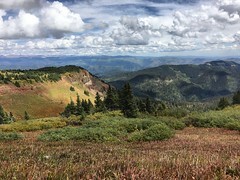 Twenty-four hours later two men and two dogs were striding (ok slowly walking) up a high mountain ridge to the cone like summit. 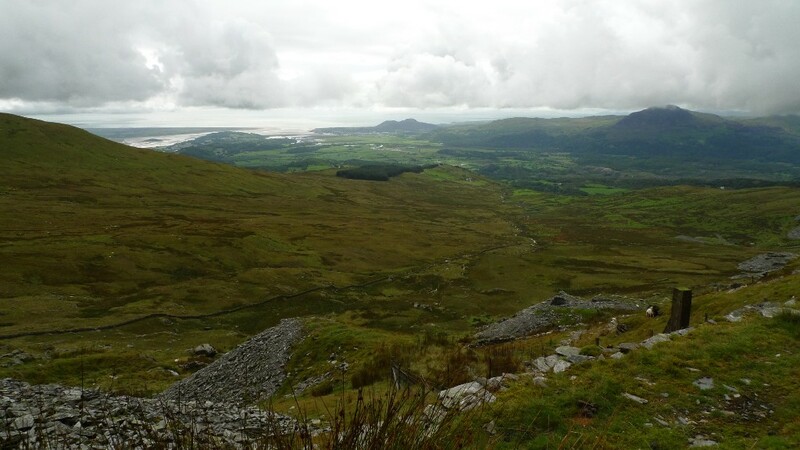 The views from the isolated peak were breathtaking, large mountains in the distance framed by extensive moorland dotted with lakes. 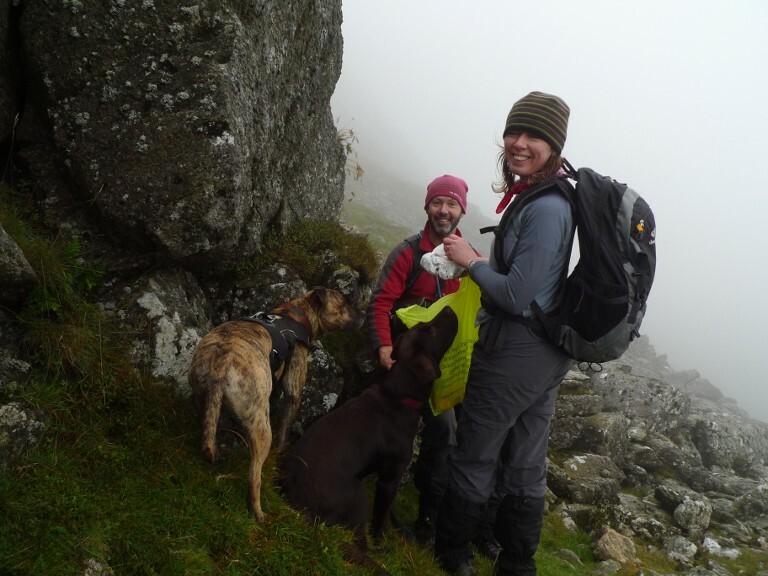 The dogs claimed the summit as their own, their human companions sheltering from the wind to eat their sandwiches. A great day in the mountains. The end of the day was marred by tragedy and human stupidity. Descending the peak we watched from a distance through binoculars as two dogs chased down and eventually killed a sheep. The chase was prolonged and brutal, the dogs owners ending up at least a kilometre away and making no effort to descend and intervene. The incident was reported when we got to the road, hopefully the owners have been dealt with. The image of the sheep tumbling over cliffs now firmly imprinted in my mind. 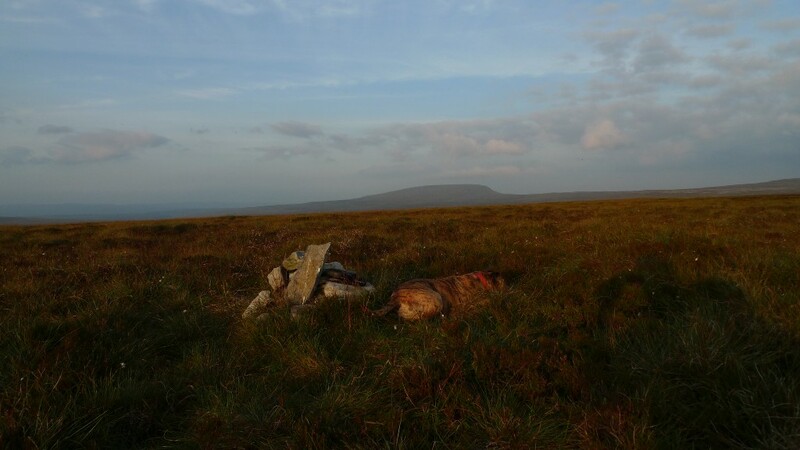 The unnecessary suffering of an animal and the local image of hillwalkers marred. Otherwise a fantastic weekend with great company, thanks to Pete, Fiona and Dougal for inviting me along. I am sure a trip report will be up on Writes of way very soon. I’ll write one too once I have dealt with my current backlog of posts! Amendment: Indeed there is a great account on Pete’s blog here.